Beaumaris was the last of the three castles I visited on my trip to North Wales two weeks ago. It is situated on the Island of Anglesey across the Menai Strait and reached by the road bridge. There is also a rail bridge, and both bridges get a fair amount of traffic, especially in the summer months. Tourists come to visit Anglesey itself or to get to Holyhead for the ferry across to Ireland. 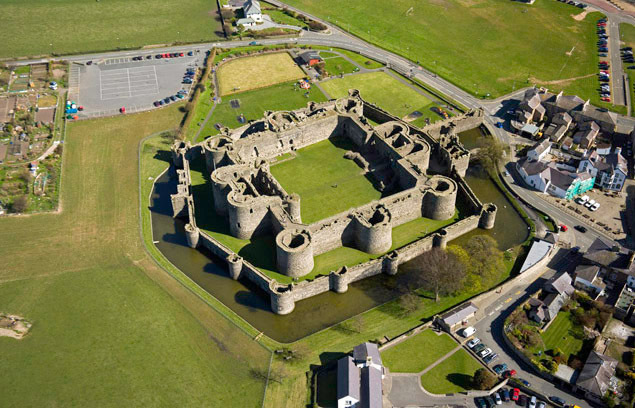 Begun in 1295, Beaumaris was the last of the royal strongholds to be built by Edward I in Wales, so completing the ring of fortresses he had begun in 1277. By 1295, King Edward had built or refurbished 16 castles, and it seems that the one at Beaumaris had been planned as early as 1283. Yet it was not until twelve years later that work began on the ‘fair marsh’ – Beau Mareys in Norman-French. Initially, great progress was made with the building. In the first year, 450 masons, 400 quarrymen and 2,000 labourers worked to dig the moat and begin constructing the towering walls. Like the castles at Rhuddlan, Aberystwyth and Harlech (and unlike those at Conwy and Caernarfon, where the shape was determined by the contours of the underlying rock) Beaumaris took advantage of the flat site and was designed in the concentric plan. 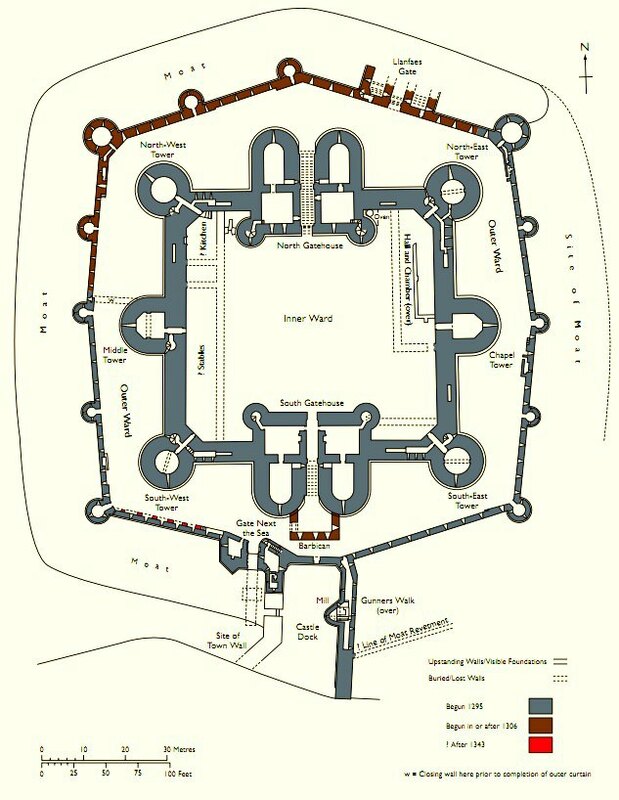 The main courtyard /inner ward is surrounded by a narrow encircling ward and both are then protected by an outer moat with a controlled supply of tidal water. Below are a few views of the outer walls, the moat (with resident swans and their cygnets) and the main entrance (called ‘The Gate Next the Sea’). Alongside this gateway is the castle dock, where boats would have moored while their cargoes were unloaded directly into the outer ward. The gateway itself was defended in three ways. First was the drawbridge across the moat, which would be raised at the first sign of alarm. Then there was the portcullis, the grooves along which this would have operated can be seen on two of the photos above. Above the inner passageway were the ‘murder holes’, one of which can be seen in the middle photo on the last row, above. Through these, attackers who succeeded in getting through the two outer defences would have met with boiling oil, as well as a barrage of arrows through arrowloops along the passageway wall. Lastly was a heavy, two-leaved door. Today, the castle is approached across a wooden bridge over the moat instead of a drawbridge, and through the main entrance into the outer ward. These are shown on the larger photo, top left, above. The inner gatehouse – through to the inner ward – was defended by three successive pairs of barrel gates and portcullises. It was sited deliberately off-line to force attackers into exposing their left flanks to archers waiting along the top of the inner gatehouse and wall. The symmetry of the castle is impressive (as evident on the above plan) although the skyline has been described as visually disappointing. It lacks the turrets of Caernarfon. Conwy and Harlech and has a definite squatness that fails to dominate its surroundings. This is because, although the work went on for 35 years, when it finally ceased in the 1330s, the towers of the inner ward were still without their top storeys and the planned turrets were never even started. There were plans for 5 separate suites of lavish accommodation, 3 of which remained unfinished. Unfortunately, Edward simply ran out of money. Here are a few photos of the inner ward and a couple looking out from the top of the inner wall over the Menai Strait toward mainland North Wales. The seagull was also nesting along the top of the inner wall. Beaumaris Castle has relatively little recorded history. Any sieges it had to withstand were not the kind to add much to its story, as those at Harlech. Like all the North Wales castles, it was held for the king in the civil war (1642-49) and surrendered to Parliament in 1646. Some partial works of demolition were carried out after that war, but most of the original structure has remained standing until the present time. Next time I go to North Wales, I’ll be aiming for the castles at Harlech, Rhuddlan (which is just a ruin) and Chirk. I camped in the grounds of Chirk Castle many years ago, when I was a robust Girl Guide at the age of thirteen. Happy memories! Love it Millie, and it just makes me want to bring my family “across the pond” to do a castle sight-seeing holiday. I was thinking Ireland, but looks like Wales is on the ticket too, and maybe northern England!! I suppose it’s a ‘take your pick’ with castles over here. There are many great ones in Wales. I’ve posted about three that I’ve visited recently, but there are so many more. Scotland has quite a few, and of course, so does England. I think a sight-seeing tour of several castles sounds like a really good idea. I’ve only been to a couple in Ireland, but I love Ireland itself, so touring the country would be great. I don’t think such an extensive tour would be at all cheap, though… that’s the downside! The swans were a real treat, especially seeing the cygnets. They were only a few days old, and the parents would have had anyone who went too close for lunch! Thank you, Jessie. YAY! It must be castle week again 🙂 Fantastic. Thanks for sharing. The age of these castles is staggering to someone ftom the New worlds. The murder holes are morbidly fascinating. I probably won’t ever get there to see this in person so it has been a joy to walk with you in the virtual sense. Thanks, Amanda! That’s a really nice comment, and I’m glad you enjoyed the quick ‘tour’. The murder holes are gruesome, especially when you think that the attackers would have been trapped in there, when to doors and portcullis suddeny close on them. Death by boiling oil is an awful thought.